Forget smartwatches, smart kettles and garden sprinklers that use Bluetooth; cross-out the first two words from the 'Internet of Things' and you've got a good summary of what that buzz-phrase means so far. However, the Industrial Internet of Things – or IIoT – is real, and it's changing the industrial world right now. The phrase was a term coined by GE a few years ago as an update to machine-to-machine (M2M) technologies, while the German government calls it Industry 4.0, but what does it mean? "It's not new, but the vernacular has evolved," says Mike Troiano, VP, Industrial Internet of Things Solutions at AT&T, which presently has 18.5 million machines connected to the internet. The IIoT is engineered very differently to the consumer-centric Internet of Things. "Think of jet engines, wind turbines, medical devices in hospitals … if I leave my Fitbit at home, it's not the end of the world, but a jet engine's connectivity solution has to run for up to 10 years – a consumer device might be thrown away after 18 months." 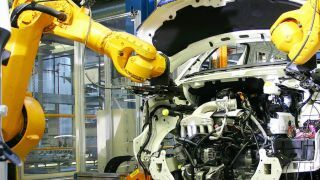 At its core the IIoT is about adding big data to create automated buildings, lighting, security, energy production, transportation, and industrial automation on a massive scale – it's the latter that currently makes up about half of the IIoT. How does the IIoT differ from the IoT? "The main difference is that where consumer IoT often focuses on convenience for individual consumers, Industrial IoT is strongly focused on improving the efficiency, safety, and productivity of operations with a focus on return on investment," says Bill Morelli, Associate Director, M2M & IoT at IHS Information Technology and Telecommunications. "There are also companies that take an even broader view who see it as a way to more tightly integrate supply chain activities with trusted partners." What's the difference between the IIoT and M2M? "M2M is a subset of IIoT, which tends to focus very specifically on machine-to-machine communications, where IoT expands that to include machines-to-objects/people/infrastructure," says Morelli. "Also, with IoT we see an expectation for more intelligence at the edge of the network, so the machine has the ability to not just communicate its status, but can potentially initiate an action in a more autonomous fashion." Why do we need the IIoT? The IIoT is for mission-critical problems, and it's changing economics. For instance, there are companies out there that have been building simple streetlights on poles for 100 years, but with cost savings from using more efficient LED light bulbs it could be possible for them to fit each light with a radio that sends an alert when the bulb finally goes. Or even fit it with a seismic sensor to measure earthquake technology, or an emergency callbox, or even digital signage, or a camera. "You take a 'dumb asset' and you've made it intelligent by using wireless technology ... the light bulb company can now sell services to municipalities," says Troiano. As well as expanding a business, the IIoT is being used to drastically cut costs – a car rental company that uses sensors to detect exactly how under-filled a returned rental car is could potentially save that company millions. Compare those two examples with the consumer-driven applications like the 'smart' light bulb that can be controlled by an app, or the ability to listen to internet radio while you're driving; both are clever, but they're not going to save anyone millions of pounds. In the wider economy, the IIoT is critical in reducing unplanned downtime of production facilities and plants.